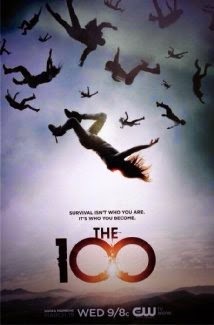 The 100 on the CW is a sci-fi drama based on a book series by Kass Morgan. The show takes place in a future where the Earth was abandoned due to nuclear war 97 years earlier, forcing humans to look to space for survival. They built and live in a space station orbiting above the Earth, with the capability of coming back to Earth with shuttles. As food and water begins to deplete, the leaders aboard the space station have to make hard decisions. They first decide to send 100 of their delinquents down to Earth to see if it is habitable. In reality, the leaders knew this would be a death sentence, to give those aboard the station a better chance with less people to drain the ship's resources. To monitor #The100 on the Earth, each juvenile is fitted with a vital signs bracelet. As life signs abruptly end, the space station begins to think that The 100 are unable to survive on the Earth. The 100 land on Earth (in once was the Eastern U.S.) and find out that the planet is habitable, and that there are humans that did survive on Earth this whole time. These humans appear to be feudal and aggressive toward outsiders, particularly The 100 that "fell from the sky." For the duration of Season 1, The 100 mainly takes place at the base camp that they have built on Earth, and the scenes back up inside the space station. However, in episode 13, the surviving 100 members are gassed by an unknown group and the episode ends inside a quarantine unit inside of Mount Weather. This indicates that there was a group of surviving humans that still possess technology and modern equipment. Which Character from 'The 100' on the CW has Developed the most over Season 1? Watch the video below to see the answer. The sci-fi show, 'The 100' on the CW ended with suspense, and the CW did not hesitate to pick up the show for a 2nd Season. According to TVSeriesFinale.com, they partly credit the CW for airing The 100 right after Arrow as the lead-in show. The 2.7 million viewers on the Season 1 premiere was a great start for the sci-fi show, and ended with almost 1.7 million viewers. Below you can see the Nielsen ratings for each Season 1 episode of The 100 on the CW. "The 100 Season 1 Ratings." TVSeriesFinales.com. iPhone Error Message: "This accessory may not be supported." © Zachary Love. Awesome Inc. theme. Theme images by enjoynz. Powered by Blogger.